Not a whole lot was expected of Iowa heading into the 2015-2016 season. The Hawkeyes were coming off a disappointing 7-6 mark, and it looked like the program was trending in the wrong direction under long time head coach Kirk Ferentz. Instead, Iowa paired a soft non-conference slate with an offense that improved dramatically, equating to a 12-0 start. The Hawkeyes came within a few inches of a Big Ten Championship and Playoff appearance, but suffered a heartbreaking loss to Michigan State. A Rose Bowl defeat further humbled the Hawkeyes and cast a shadow over what was an extremely successful year. Iowa returns a ton of key contributors from last year's surprise, and the Hawkeyes should once more roll through a weak non-conference schedule and a Big Ten West Division that has struggled over the previous few years. Backfield: There were questions when two-year starter Jake Rudock transferred to Michigan prior to the '15 campaign, leaving junior C.J. Beathard as the starting quarterback. While Rudock ended up putting together a wonderful final year with the Wolverines, Beathard was not shabby himself. He threw for 2,809 yards and 17 touchdowns in a run-orientated offense and showed excellent command of the offense. 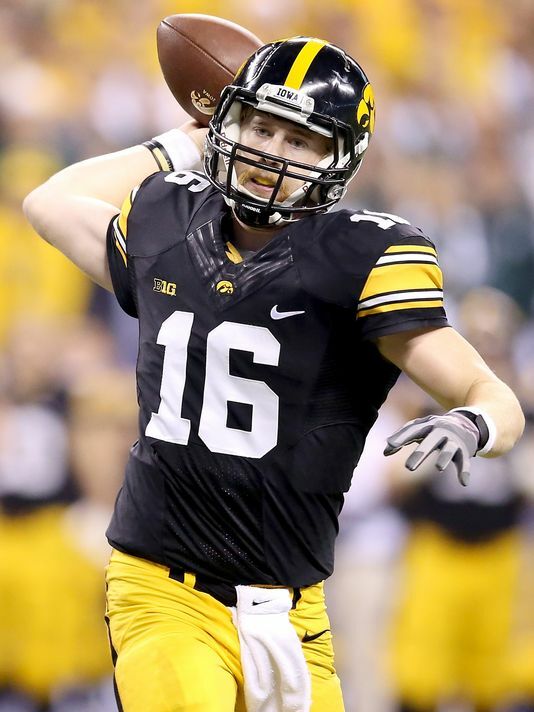 Beathard doesn't turn the ball over (five interceptions on 362 attempts last year) and has a great feel for the game. The senior may not wow anybody, but he is the type of rock-solid, smart quarterback that Ferentz loves and work well with. He should continue to improve into the 2016 season, and Hawkeye fans hope he will throw the ball down the field more, as he has displayed good arm strength. While Beathard was great last year, Iowa's main source of offensive success was on the ground, as they used a committee approach. Jordan Canzeri, Akrum Wadley and LeShun Daniels all saw significant carries and all played very well. Canzeri graduated this offseason, leaving Daniels as the likely feature back. Canzeri was the Hawkeyes' leading rusher, with 984 yards and 12 touchdowns. However, Daniels showed excellent promise last year, with 646 yards and eight scores himself. While Canzeri moved the chains with power, Daniels showcased some excellent speed and explosiveness last season. Those traits should serve Iowa very well, as it should add some vitality and buzz to an offense that is purposefully pretty boring. Wadley, a junior, should still see a very healthy dose of carries, after running the ball 83 times a season ago. Wadley has some serious talent and averaged six yards per carry last season, but is extremely fumble prone, which could limit his opportunities. A year later than expected, it is time for Derrick Mitchell to show the world his immense talent. Mitchell switched from receiver to running back prior to 2015, and was receiving rave reviews during the spring and on to fall camp. However, he never really got the chances he needed, rushing for just 162 yards. Mitchell has wonderful speed and fantastic vision, and he should have plenty of success beyond Iowa's big blockers up front. Sophomore Marcel Joly is back to provide further depth to a unit that should see plenty of different weapons being used. Receivers: The Hawkeyes are not known for being a school that produces wonderful talent at the receiver position, but they do have a solid group again in 2016. Tevaun Smith, their leading receiver in 2014, put together a strong 2015. He proved to be a reliable weapon down the field, recording 563 and averaging 17.6 yards per catch. His departure opens the door for improvements from a number of guys who hold wonderful promise. Sophomore Jay Scheel could step up in a big way after having a great spring. A redshirt in '14, Scheel did see action last year but didn't do much. He has good hands and is a solid route runner. He may not be a 1,000-yard guy, but he could be a solid weapon for Beathard to work with. Fellow sophomore Jerminic Smith has great speed and solid size, which should enable him to have success against smaller Big Ten defenders. Smith also displayed his vast potential in the spring, and averaged 23 yards per reception in 2015. That was on just six catches, but it still showed that he can make plays down the field. Senior Riley McCarron had five catches last year, but should have better numbers this season. McCarron is undersized, but he could serve as a capable pass-catcher that can find lanes and move the chains, which fits perfectly for Iowa. Those three should play a much larger role after a relatively confined role last year. However, the clear star in the unit without Tevaun Smith has to be senior Matt VandeBerg. A former big-time Midwest recruit from South Dakota, VandeBerg has continued to grow and flourish in his time with the Hawkeyes. He has extremely undersized when he came on to campus, but has since bulked up considerably, which has really helped him. VandeBerg had 65 catches for 703 yards, and should continue to be Iowa's top weapon in the aerial attack. The tight end position could be in very good hands, even as Henry Krieger-Coble moves on. Krieger-Coble had 35 catches for 405 yards a year ago, and was a great leader. Even so, senior George Kittle should keep the position as a strength. Kittle is not a great playmaker, and he won't catch 35 passes this year most likely. He succeeds as a great run-blocker and a guy that can occasionally sneak out for a pass. He had six touchdowns last year, becoming especially dangerous in the red zone. Joining Kittle will be sophomore Jameer Outsey, a likely breakout candidate. Outsey had just one lone reception last season, but is much more of a dangerous pass-catcher than Kittle, with a wide, lengthy frame and good hands. Offensive Line: Iowa has always been a smashmouth, physical football team and the offensive line often sets that tone. Ferentz was an offensive line coach in the NFL early on in his career, so he often focuses on the unit, which is always strong with experience and talent. The Hawkeyes should be especially powerful up the middle, where they are blessed with great center Sean Welsh, a returning starter. Welsh is a well-rounded blocker who already has a great relationship with Beathard. Junior Boone Myers will also play an important role. Myers was a left tackle last year, but the Hawkeyes are likely going to shift him around to guard because they are thin at the position. Myers is a versatile blocker blessed with good technique and mobility. The left tackle spot should still be in very good hands even as Myers moves. Senior Cole Croston spent most of last season at right tackle, but the transition should not be very hard for the veteran. Croston has good size, and knows how to block in the brutal Big Ten. The right side of the O-Line doesn't have quite as much experience, but there is great potential there. Sophomores James Daniels and Keegan Render should compete for the starting gig at right guard, both unproven but good run blockers that should clear lanes for Daniels and Wadley. At tackle, senior Ryan Ward is the favorite to lock down the job, but junior Ike Boettger is massive and has a higher ceiling. The Hawkeyes are very excited about the future of the Paulsen twins on the line. Landan and Levi both weigh in at 6'5", 305 pounds and received a redshirt last season. They are both gritty, hard blockers that fit the Iowa style perfectly. Levi is probably going to push for playing time at left guard, while Landan is more natural at right. Three-star prospects Spencer Williams and Alaric Jackson will also fight for snaps and provide valuable depth. Jackson, especially, has the potential to become a star, as he towers over opponents (6'7") and was wonderful during his time at Renaissance High in Detroit. Defensive Line: The Hawkeyes' defensive line was far from bad last year, but it could have been even better. Defensive end Drew Ott was dominant through the season's first half, recording five sacks and 7.5 tackles for loss in six games. Unfortunately, he tore his ACL ending his season and in turn, his Iowa career. Not only will Ott not be back, Big Ten third-teamer Nate Meier also is gone after playing very well in Ott's absence, with seven sacks. The search for the team's next top pass rusher is on, with sophomore Parker Heese being a very strong candidate. Heese proved he could make plays last year when he was forced into action, with 44 tackles. He should grow into a more disruptive force off the edge this year, as he added a ton of muscle. He had two sacks last year and also showed he could impact games in an interesting way, picking off two passes. He will be joined by a good core of veterans that should lock down the defensive tackle roles. Junior Nate Bazata and senior Jaleel Johnson should have very good years. Bazata was a great run stopper last year, with 42 tackles, while Johnson also helped. Johnson is a very underrated pass rusher, using his deceptive speed to pick up 3.5 sacks last year. He was helped by opponents focusing on Ott and Meier, but he should still have a great year. The defensive end spot opposite of Heese that was once held by Meier is a major question mark. Sophomore Matt Nelson showed excellent potential last season, but is obviously pretty unproven. He had 13 tackles and one lone sack a year ago in a reserve role. He may not be very quick or agile but he gets by with power (6'8", 270 pounds) and he uses his long arms to get in the face of opposing quarterbacks. Redshirt freshman Anthony Nelson is also going to be in store for a much larger role. Nelson has excellent versatility, and could help out at either defensive end slot. Iowa is hoping that true freshman Romeo McKnight could possibly come in and make plays this year. McKnight is a three-star gem out of Crystal Lake, Illinois that could see plenty of opportunities with the end position not being particularly deep. Linebackers: Back in 2014, Iowa was replacing all three linebackers and a successful unit seemed unlikely. They responded by becoming one of the conference's better units and allowing just over 300 yards per game, one of their better marks in years. Last year, they were also replacing a number of key contributors to the unit and were very inexperienced. Once more, the Hawkeyes defied logic by performing wonderfully once more, headed by the linebacker corps. They should not have the questions surrounding the linebacker group they had last year, as a solid group is back. That group is led by junior Josey Jewell, one of the nation's most underappreciated defenders. Jewell quietly recorded 126 tackles a year ago, and stuffed the stat sheet in other ways. He had four interceptions and six pass deflections, along with 7.5 tackles for loss. Jewell returns to lock down the middle linebacker spot, which obviously plays a key role in Iowa's 4-3 defense. Expect him to be making plays all across the field again in 2016. The other returning starter to the unit is going to be junior Ben Niemann, another productive player. Niemann doesn't have the range of Jewell, but he can still make plays, with 45 tackles and three sacks a year ago. He is an okay pass rusher, but is well-rounded overall. Junior Bo Bower was slated to start a year ago, but lost his job to Cole Fisher, who was wonderful. Fisher came in and compiled 116 tackles and six pass deflections, but that didn't mean Bower didn't contribute. He had 15 tackles and also had an interception that he returned 88 yards to the house. He may be a backup to Niemann once more this year, but he has good experience and fits the system well. The Hawkeyes are going to have a competition to replace Fisher at the other outside linebacker spot. Sophomores Jack Hockaday and Aaron Mends are the two main competitors, with Bower possibly in play. Hockaday had a good spring, and a lot of people around the team think he could have a breakout year, while Mends showed solid promise a year ago despite very limited playing time. Secondary: There is a long list of elite defenders in the Big Ten: Anthony Walker (Northwestern), Riley Bullough and Malik McDowell (Michigan State), Jourdan Lewis and Jabrill Peppers (Michigan) and Raekwon McMillan (Ohio State), to name a few. 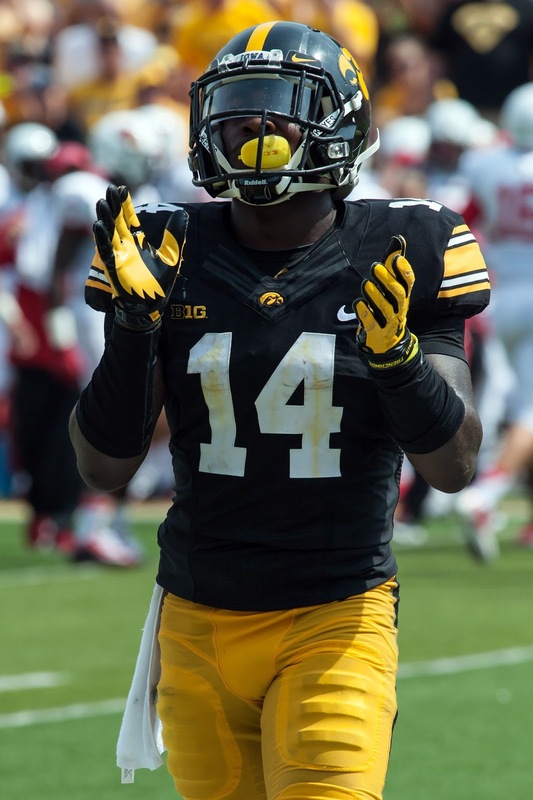 But, even they pale in comparison to Iowa cornerback Desmond King, one of the game's best playmakers and the 2015 Jim Thorpe Award Winner (nation's best defensive back). King came into the season as an established corner but was even better than many expected. He picked off a total of eight passes, and compiled 118 return yards, an average of 14.8 yards. That consistently put Iowa in great field position, and he also made those interceptions often at crucial moments in games. King received good NFL Draft attention, but opted to return for his senior year in Iowa City. He will be tasked with some of the conference's best receivers, but he can certainly handle it. It may be hard for him replicate his eight interceptions, but he should still put together a big year. He is joined at the cornerback position by senior Greg Mabin. Teams may try and pick on Mabin to get the ball away from King, but he is no slouch. He had 54 tackles and two picks last year and brings impressive athleticism to the table. Those two disciplined veterans should give Iowa perhaps the nation's best 1-2 punch at the position. Iowa is also very solid at the strong safety position, as junior Miles Taylor returns. Taylor is a difference-maker who can lay down some huge hits. He recorded 69 tackles a season ago, while also proving to be a decent coverage option, batting down four balls. Taylor has excellent closing speed and is a very reliable last line of defense. The free safety is the big concern in the group, as Jordan Lomax moves on. Lomax's 97 tackles in 2015 will be very hard to replicate, and the Hawkeyes are not very deep at the spot. Sophomore Brandon Snyder is considered the favorite, after picking up 11 tackles last year. He doesn't have Taylor nor Lomax's closing speed or athleticism, but he can still make plays when called on. Fellow sophomore Jake Gervase should see a healthy dose of snaps at free safety after seeing action in two games last year. Special Teams: The Hawkeyes will have to break in new starters at both punter and kicker in 2016. Marshall Koehn is gone at kicker after knocking down 16 of 20 field goals and helping out as punter. Sophomore Miguel Recinos filled in for two extra points last year and should take over the position, and possibly even start at punter. At returner, King can make some great plays, particularly on punts, where he averaged 14.2 yards per return. Last year's Rose Bowl blowout loss to Stanford played right into Iowa detractors hands; that they had played nobody and were finally exposed by a great football team. Even though it was disappointing, Iowa was a very strong football team last year, and there 12 wins and Big Ten West title are clear evidences of that. They return so many key pieces from that team and could even improve, particularly Beathard and a couple of their receiving options. Their schedule is once more very favorable, although a September 17th meeting with FCS power North Dakota State could be very intriguing. Iowa gets their three toughest opponents, Michigan, Wisconsin and Nebraska all at home and should take full advantage of that. Iowa will not sneak up on the nation like they did last year, as people should realize the talent they possess. However, that doesn't mean they can't surpass expectations and perhaps even sneak into decent College Football Playoff position, while claiming the Big Ten West.